Those beautiful yellow stars that appear just under page titles in search results are a shining opportunity to tell searchers that you are trustworthy. And you’d be surprised at how easily you can implement them on your site! Some companies see an increase in clickthrough-rate as great as 20%-30% after implementing star ratings in their search results. It works like a referral, in a sense. In the same way that people are more likely to purchase a product a friend recommends, users understand that stars are representative of someone’s experiences with a product or brand. Searchers are more likely to trust a website listing with a favorable star rating than a website without one. It’s a confidence (and clickthrough) booster! Let’s take a look at the three ways that you can add star ratings to search results for your website, location, or products. Christopher Zook of WebFX explains how you can add star ratings to your website’s search results. Google reviews on your Google+ account are the easiest way to achieve stars in branded searches — that is, searches for your business. To implement star ratings in this way, all you have to do is have reviews on your Google+ page! The number of reviews you need to begin showing stars seems to be something Google is changing relatively often. 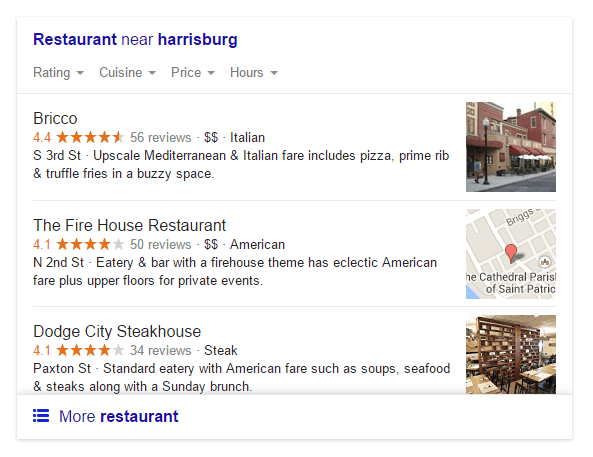 At this time, Google is requiring at least five reviews before showing ratings in searches. Now, this does not mean you should start reviewing your website from a bunch of different accounts! Google has gotten pretty smart about reviews, and notices when things are out of sorts… or when you get a bunch of reviews all in the same half hour period. You should also avoid incentivizing Google+ reviews as this will lead to an unnatural number of reviews. Not only does this look bad to Google, it also looks bad to potential customers. Most users pick up on fake or paid reviews that seem a little too positive. Instead of bribing customers or making reviews up, actively encourage customers to leave their feedback. Ecommerce companies should follow up transactions with a thank you email that includes a link to Google+ reviews. Other companies have successfully encouraged reviews by highlighting recent positive reviews in their emails. Customers will feel important for being noticed, and this will encourage them to review you. Everyone likes to be recognized – even if it’s for recognizing you! Another option that can arguably have the largest impact on your results is organic review markup code. Adding this language to a single product page will allow that product to show stars in search results. This is especially ideal for ecommerce websites. based on <span itemprop=”ratingCount”>301</span> user ratings. Paste the code onto the product page you’d like to show stars in search results. Don’t forget to customize the bolded part of the code to display the language and data you desire! Check your work with Google’s Structured Data Testing Tool. Google will let you know if there are any mistakes in your code. Resubmit your XML sitemap in Google Webmaster Tools to ensure that Google indexes your changes as soon as possible! Fun fact: Google is not requesting proof of accuracy of these statements at this time. This seems like a divergence from the search engine that wants to provide accurate information on everything from content to location. We expect that Google will eventually update its policy to require some kind of authentication. For this reason, we do not recommend falsifying your review information. However, this does mean you will not be penalized if this information is not immediately updated when new reviews are posted. With this method, your website’s homepage will not show stars in search results based on this code. Unfortunately, Google announced in mid-2014 that it will not look favorably at rich snippits on the homepage since it seemed like an “unnatural” practice. Pursuing Google+ reviews is the easiest way to at least ensure that you have star ratings on the homepage for branded searches, and for B2B companies that do not have product pages to take advantage of. Getting stars on your AdWords ads is the most difficult to achieve. Google automates this process, and you have very limited control over whether stars appear with your ads or not. Google uses specific third party review sites as a means of determining your star rating. On these sites, you must have at least 30 unique reviews from the past year, and the aggregate rating must be a 3.5 or higher. As I mentioned, Google automates this process. So, it is unlikely, but possible, to meet all the requirements and still not see stars on your ads. To get stars in search results there are three different methods: Google Plus reviews, code language and third party reviews. Each is useful in different circumstances. Try them out and let us know how they worked for you! Krista is an Internet Marketer. You can follower her on Twitter @KristaPalmer1.